I'm afraid I'm falling for football madness right now. During my trip to Germany I started these socks. The are for my sister's boyfriend, the two of them hosting a kick off party tonight (BBQ in the garden, no, I'm NOT jealous! I'm happy that I don't have to wear a raincoat over my t-shirt, sweater and fleece jacket) When my sister received her surprise socks, she really liked them. Unfortunately, she is highly sensitive to wool and can only wear them with protective cotton socks underneath. Thus, it was not ideal to send them out in spring. But her boyfriend got over-excited about the idea to have handknit socks. Almost as if he had never heard of this concept of clothes before. 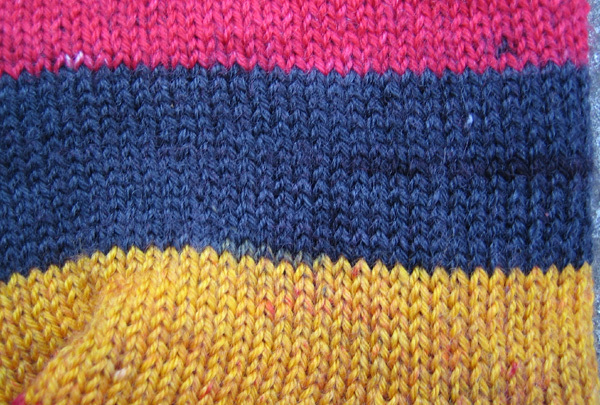 However, to lift up his mood (my sister is the football fanatic, he has to suffer) I decided to knit him a pair of fan-socks to support the German team. They/he will need some cheering. Knitted in three German federal states and finished in Iceland they made their way back just in time to join the kick off tonight. I have to admit that I am not very happy with the yarn. 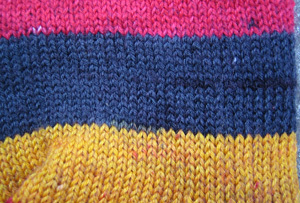 I have knitted the German stripes and Rainbow stripes from Regia before and both yarns are the better choice. First, I think Regia has the nicer touch but that is probably just me. Undoubtly though, Regia does a far better job dying their yarn. Their stripes are clear, saturated, even. Lana Grossa's stripes are rather pale, blurry, freckled and even have undyed spots. Well, you don't really see it down on the feet, but I know it is there. And since both yarns are pricewise in the same category (in Germany at least), I do think, Regia offers better quality here. See here? The black stripe on the right in the more nightblue area is an obvious flaw in the dying process. Also, the light spots are no reflections from flash or sunlight, they are just there and you can probably also see the red spots in the yellow stripe. I'm not pleased. The yardage is also poor. I decided to cut some amount of yellow out in order to keep the flag stripe running over the span. Knitting up small men size socks (~43) with a rather short cuff, I ran out of yarn and had to puzzle out how to do the toe. In the end, I had only about one and a half yellow and one black stripe left. And loads of strands to weave in!!! That's not a grown-up men's pair of socks and not a relaxing knit either. But as they say, German football style is clumsy and dogged rather than elegant or laid-back, too. by Carola at 3:58 e.h.
You did a great job and I'm sure he'll love them! Glad you're back in one piece. júní 09, 2006 6:26 e.h.
Fabulous picture composition! Too much fun! júní 09, 2006 6:59 e.h. Your sister's boyfriend will love them. It's too bad about the poor dyeing (although he certainly won't notice, and neither would I have if you hadn't pointed it out). Honestly, it's not like Regia is some first-time dyer working out of her kitchen. Exasperating. júní 10, 2006 12:09 f.h. Despite your troubles with the yarn, the finished socks look great. I've been trying to come up with soccer sheep for the World Cup, but I've been failing at creating a clay soccer ball. Sigh. 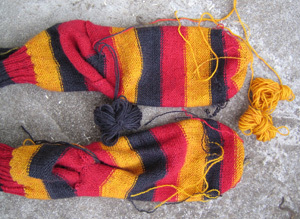 júní 10, 2006 6:24 e.h.
Allerdings, bei den River Rapid socks, die ich gerade (nicht) stricke, da färbt das LG tweed total ab und ich kriege blaue Finger... nicht sehr überzeugend. júní 12, 2006 10:17 f.h. Just got a whole bunch of that Lana Grossa team colors yarn. It'll be waiting in Germany for me for our July visit. I can't wait! Yours look great, although I see what you mean about the Regia colors being a bit bolder. júní 20, 2006 2:19 f.h. júní 21, 2006 4:45 e.h. 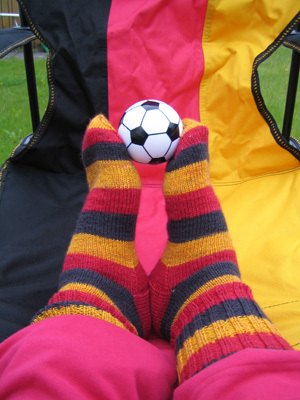 I also have knitted a few pairs of Germany-socks with Team Color by Lana Grossa. I loved knitting them. I also saw the Regia pendant. I preferred the Lana Grossa yarn because I thought the golden colour was absolutely amazing. The little spots of red in the golden stripe or black in the red one gives the colours some kind of life. I loved it. And I was sad when I bought the final 4 yarn balls at my local store. júní 29, 2007 7:44 e.h.